Our South Dakota Land Hunt! 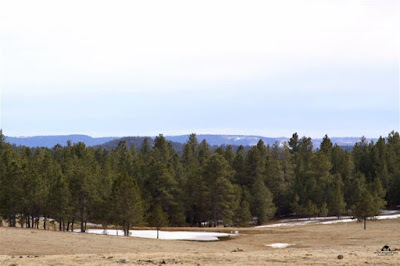 Few places touch our hearts like the Black Hills of South Dakota…Other places might include the farmlands of North Dakota, the forests of Northern Wisconsin or the lakes in Ontario. We have talked about each of these areas (except Ontario) as an ultimate landing place when we stop traveling or perhaps slow down a little and the Black Hills is at the top of our list! Why you ask? If you have ever been here and seen the beauty of the area yourself, you know the answer. But there are other reasons as well. How about no mosquitos? The abundant wildlife in the form of deer, elk, antelope turkeys and buffalo. For us, it is centrally located to many of the other activities we like to do and has all four seasons without a harsh winter. All of these things combined has really brought it to the top of our list of areas to look for property. This is probably our 6th or 7th trip out here looking for property and we have narrowed down our search area and are ready to pull the trigger! Speaking of snow I don’t think we have had a day we have not had snow in the past week. We ran into quite a bit of snow on our drive to Casper and even more when we arrived there. As a matter of fact we stayed an extra day in Casper so we would not have to travel in the snow. Does it get any more beautiful than this? Dakota LOVES playing in the snow! When we arrived to the Black Hills, we had originally planned on dry camping at Ditch Creek Campground but a look at the forecast for the first few days we were in the area called for continued snow and rain so we diverted to a campground where we at least had power to keep us a little warmer. Country Charm Cabins is has a small campground with deer and turkeys all around the property driving the dogs crazy throughout the day. So what are we looking for in the perfect piece of property? Numbers 1, 2 and 3 on our list are a view, wildlife and being remote. Of course price also plays a key role. There are plenty of beautiful places if you have a couple of million. Our budget is WELL below that. Ideally we would like the property to border National Forest lands but that is not a deal breaker. Water and power is also a consideration. 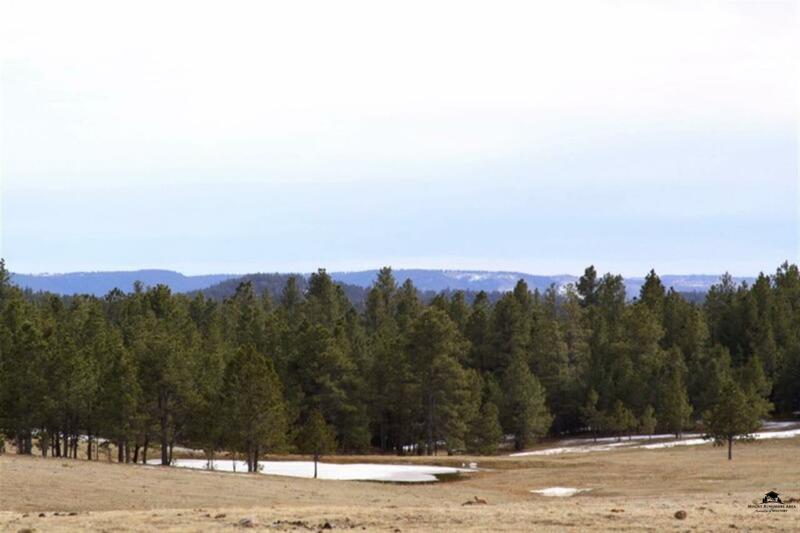 In many areas of the Black Hills the water is just too deep to practically have a well. Some areas have rural water (~$80-120/month) while others have no water at all and require you to truck in your own water. 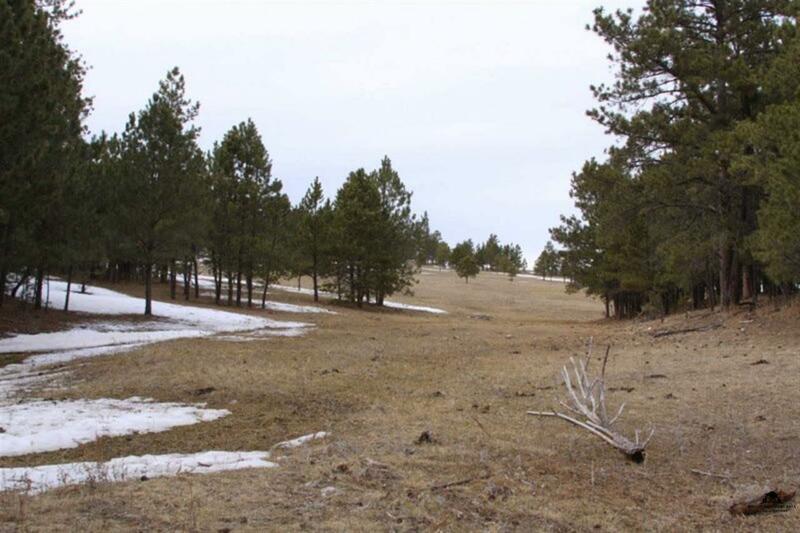 Working with a realtor we narrowed our search down to about a dozen properties in the Custer/Pringle area. Some of the pieces were as small as 5 acres while the biggest was 80 acres. Some had huge sweeping views while others had smaller views of valleys or pockets of forest. We weren’t tied to one view or the other as long as we liked what we saw. We drove by some eliminating them without getting out of the truck and eliminated more after walking them. Finally we had narrowed down our choices to 3. 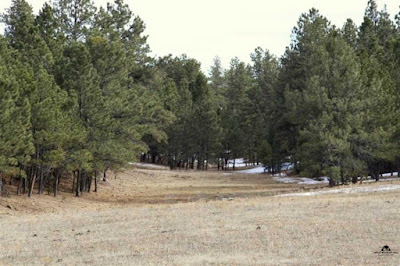 The remote 80 acre piece, and a 5 acre piece bordering National Forest land and a 50 acre piece which also bordered the National Forest. Each had their pros and cons and were unique in their own special way. The 80 acre piece had sweeping views and several deep ravines. The down side it was really remote and would cost almost $20,000 to bring power in, no water and did not have the amount wildlife we were envisioning. The 50 acre piece was about ½ open and ½ wooded. It had power right to the property line but would require us to truck in our own water. The wildlife in this area is incredible! 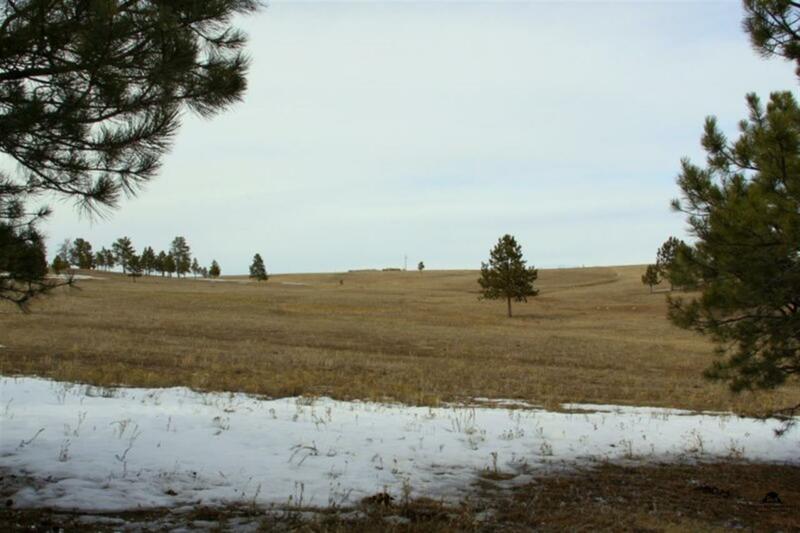 The 5 acre piece was along a road but it bordered National Forest land and had great views as long as no one built in front of you. Our plan was to continue to walk each of these pieces, look for building sites and get a feel for each of them. Do we see ourselves living there? After walking each piece on more time we decided that the 50 acre parcel was the one for us. We would need the seller to come down a bit to get it into our comfortable price range but we were confident that we could get the deal done. Meeting with our realtor the next day we told her which piece we decided on and what we would like to offer. That is when she informed us that the seller had rejected a higher offer just a few weeks before and did not seem willing to go much lower than their asking price! Disappointed we did not even bother writing an offer and headed back to our rig. With the weather forecast calling for warmer, sunny weather we decided to move up to Ditch Creek. Although it was only 30 or so miles what a difference! We noticed a little snow as we were driving from Custer to Hill City and a little more from Hill City to Ditch Creek Rd. But we were not prepared for the amount of snow we found on the road itself! Apparently this little valley receives and retains more snow then the surrounding area! Once on the road you are really committed as the first place to turn around is 4 miles down the road at the campground itself. The road was slick and sloppy requiring us to put both vehicles into 4WD. Even with that we slipped a little going up a few hills. Luckily we made it to the campground without running into any other traffic. It was apparent that no one had been to the campground in quite a while and after a little slipping and sliding we got the rig parked into our favorite site. Ditch Creek is a beautiful campground right along one of our favorite trout creeks. Usually $15/night the campground is free during the off season. 047 Over the next couple of days the snow had melted but then late the following afternoon it started to rain, eventually turned to snow and we woke up to over 7” covering the area! Down, but not out we continued to drive around looking at different pieces of property. We were driving by a 45 acre piece we had written off on a drive by during our last visit to the area when Barb said “let’s just stop and walk it”. From the road it looks like an open arid 45 acres. We saw nothing but a prairie dog village. You could not see the entire property due to a hill so we decided to walk it anyway. Once we got out and started walking it we discovered that it has a 20 acre wooded section you cannot see from the road. Not only that there were beautiful views, a small valley in the pockets of the trees, and we saw deer and signs of turkey in the area. After our initial walk we liked this piece even better than the 50 acre parcel! The following day we walked the 45 acres with our realtor and her husband to make sure where we thought the boundaries were were indeed the boundaries. After they left we walked it again and stood in several areas that we thought might make great house sites. We also marked each of the survey markers with our GPS. When we got back to the truck we entered them into Google Earth to get an idea of how the property laid out with the surrounding area. So much goes into making a decision like this…excitement, doubt, fear….do we want to settle down here eventually? Do we want to spend this much money? Is this the right place? Without any hesitation we said yes to each of those questions and the next day we wrote up an offer. We were not expecting the seller to accept that offer and of course they didn’t but after a little back and forth they accepted our offer and we are set to close in less than two weeks! We are very excited about this new adventure, having a home base, having a place for friends to stay over when in the area and thinking about when and what to build over the next couple of years. More to come on that in the future…….. This was our 3rd trip to Moab. Our first trip was in 2014 where we camped for the weekend with our son Forrest and his family, our second trip was in 2015 where we spent a few days visiting our friends Dino and Lisa. This time….we were alone. After leaving Lake Powell we spent the night at Sand Island BLM Campground in Utah. This was a nice little park with several big rig sites right along the river. We arrived at OK RV Park in Moab the next day. This is the campground where Dino and Lisa worked for two seasons and once we mentioned we were friends of theirs we were given the royal treatment! Given the best spot in the park, a welcome basket that included caviar, Champaign and chocolate covered strawberries, free passes to the spa and turndown service every night. Well, maybe not but the owners and their former co-workers do miss them. At $20/night with Passport America this is a great little park to stay at for a few nights. We were staying 2½ days/3 nights so we thought we would get a couple of hikes/jeep adventures in but between the chores and rain we only ended up getting one adventure in. But what an adventure it was! Friends John and Pam have been here multiple times so we searched their blog for the ultimate hike. After reading several of their posts and texting back and forth we chose two hikes in Arches National Park; Tower Arch and the Fiery Furnace ranger led hike if we had time. We had never been to Arches so we were looking forward to the visit. There are over 2,000 arches in Arches National Park. I am happy to report that only have about 1,995 left to see! Needless to say we have many visits ahead of us if we plan on seeing any more. At the Visitors Center we discovered that the Fiery Furnace hikes were not starting for a couple of weeks so we just got our Passport Book stamped and off we went! 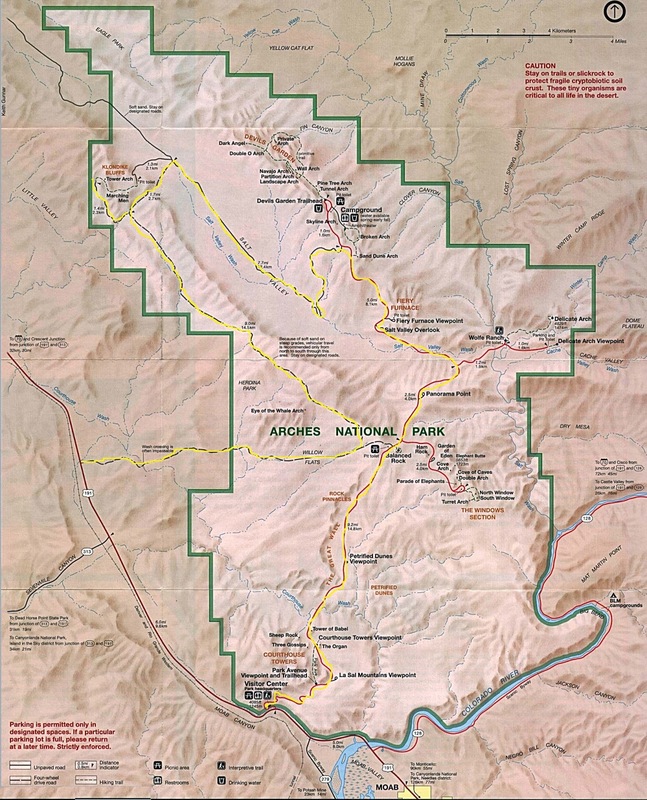 The Tower Arch trailhead is in the northwest corner of the park meaning we had to drive almost the whole length to get to the trailhead. Perfect opportunity to see the varying landscape within the park! 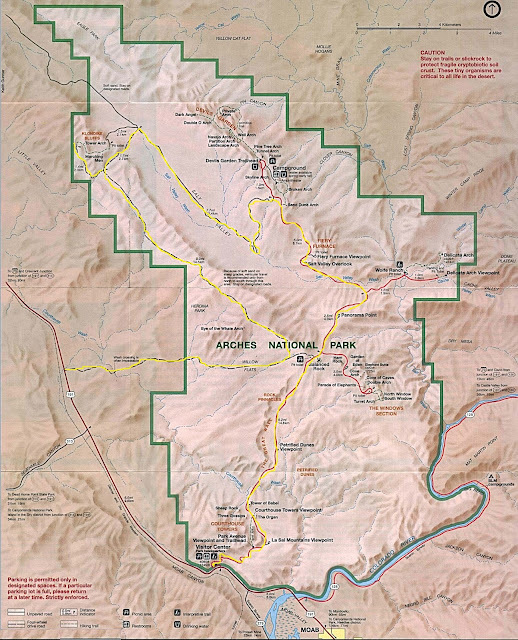 We had originally planned on taking the 3.5 mile roundtrip hike to the arch but while reading the trail description on the way to the trailhead we discovered that there is a jeep trail that leads to another trailhead only .3 miles from the arch. The description said that it was a rough jeep trail requiring 4 wheel drive, high clearance and was often impassible after rain storms. Looks like the perfect opportunity to do a combo adventure! When we left the main road onto the jeep trail it was smooth sailing for the first mile or so. We thought this was going to be a piece of cake and we would be at the .3 mile trailhead in no time. We soon learned at we were wrong……very very wrong. What started out as a 25mph gravel road quickly turned into a 1-5mph rock crawl. On a difficulty scale of 1-10 I would give 5 or 6. There were no real pucker moments but it was rough and you had to go very slow and pick your spots or you would find yourself hung up. There were several times Barb got out to take pictures and was walking faster than I was crawling over the rocks. We spent the next hour and a half in 4 low crawling up and around obstacles as we made our way to the trailhead. It was a blast! There were views in every direction! Once we got to the trailhead we could see Tower Arch right in front of us. The challenge was getting to it. There is a sign that tells you to stay on the marked trail which we had no problem doing for a while until it lead to a slick rock section where the trail totally disappeared. After a little trial and error we found the right trail and soon we were at the arch! Which way to the arch? ....while she went to the right where there is another smaller arch that is worth exploring. When we met up an hour or so later back at the jeep we found that our .3 mile hike had turned into a over 2 miles of hiking and exploring. We wanted a different jeep trail on the way out. This trail led south 9 miles and west another 7 before it intersected highway 191 outside the park. There are several areas of soft sand so only north/south travel is recommended on this road. After going through it and seeing the tracks left by those trying to go north, I don’t know how you could ever do it. Along the way we passed Eye of the Whale arch, another one we can cross off our list! After exiting the park (after about mile 4 of our westerly leg) we found ourselves in the Willow Springs boondocking area. We had wanted to check it out to see if this is somewhere we would want to stay on future trips. It was packed! Kids, 4 wheelers, dirt bikes…doesn’t anyone work or go to school anymore? It must have been spring break at school or something. There were a few spots that our rig would fit but if it is always this crowded we will pass. We got back to OK RV Park at about 4pm meaning our entire trip took about 6 hours. This is about our limit for leaving the dogs alone so it worked out well. The next day it rained almost all day so we read, did some laundry and walked the town just to get out and about. Being cooped up in the rig that third day cut into our adventure time and made this trip to this area seem short. Time to move on and make our way north!